>2011 Grammy Nominations — Predictions! >As much as it pains me to acknowledge it, Eminem will almost definitely be the Grammy leader when nominations are announced later today. Although his recent album “Recovery” is still a sub par outing, Eminem had a huge hit this year with Rihanna that was still on Grammy voters minds when submitting nomination choices a few weeks ago. A lot has been made about the fact that he’s never won Album of the Year in the media, and the fact that he’s been very present this year with feature work and his album selling as consistently well as his previous outings will assure him multiple nominations (even though his album was garbage, but hey that’s just my opinion). He’ll be a lock for Album of the Year as well as Record and Song of the Year for “Love the Way You Lie” with Rihanna, and he’ll dominate the Hip Hop categories. 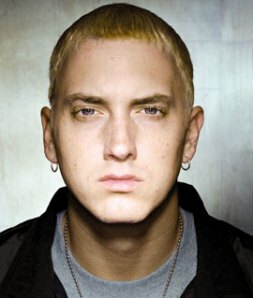 Other than Eminem, the other leading nominees will most likely come with a lot of surprises. I’m honestly not as confident with my predictions this year as in previous years, but there are some artists that made such a big impact this year I couldn’t imagine them being left out. And given last years nominees, the popular acts and best sellers will probably be the most mentioned when it comes to nominations. Judging by that, I have an instinct that this year may be a big year for Hip Hop in the Big 4 categories (Album, Record, Song and New Artist of the Year). Eminem’s “Recovery” is a lock for Album of the Year, but I also wouldn’t count out eligible albums by Drake (“Thank Me Later”) and Jay-Z (“The Blueprint 3”). Jay’s album came out last year right after the cut off, but the album received critical praise and ended up having three really big mainstream singles. His only problem is since the album was released so long ago, it might be forgotten. Even if he doesn’t get that big nomination for the album, I could see “Empire State of Mind” with Alicia Keys up for Record and/or Song of the Year. Drake was the new artist with the biggest hype last year, and even though he didn’t have his album out he was up for three awards, so it seems obvious that he will be back again this year, and since his album was a steady seller it wouldn’t be surprising to see him in Album of the Year. He seems like a shoe-in for New Artist of the year however (and will probably win). B.O.B. will most likely be up for New Artist of the Year as well, and even though his album might not be up for the top prize, his single “Airplanes” was so massive it’s sure to be competing for Record or Song of the Year (possibly both). Eminem, Drake, Jay-Z and B.O.B. are sure to be favorites in the Hip Hop categories, and I believe they will probably be competing with themselves in certain categories. B.O.B. will probably get two nominations for Rap/Sung Collaboration for both “Airplanes” and “Nothing On You” with Bruno Mars. Same for Jay-Z who should find “Empire State of Mind” and “Young Forever” with Mr Hudson competing against each other. Drake’s “Over” and “Miss Me” will surely be up for nods. Also expect to see Ludacris, Young Jeezy, Rick Ross, and Nicki Minaj whose feature work should snag her a few nods, as well as her hit single “Your Love”. As far as Pop music goes, Katy Perry will probably come out with a bunch of nominations. Her album “Teenage Dream”, which is better than some of the Album of the Year nominees of last year, will probably miss out in that category. However her name should pop up in most of the Big 4 categories, as the albums title track is surely deserved of Song and Record of the Year nominations as well as Pop Vocal Performance, Female. The album should get a Pop Album nomination, and depending on how her label plays it “California Gurls” with Snoop Dogg could be up for Dance Recording or Pop Collaboration with Vocals. Lady GaGa was one of the nomination leaders last year, and expect her to be up for alot this year for her singles and videos from “The Fame Monster” EP. That release is only 8 songs long, and it’s doubtful it will be up for Album of the Year. However “Bad Romance” is sure to be up for Record or Song of the Year, as well as Female Pop Vocal and Dance Recording. Her and Grammy favorite Beyonce‘s collaboration “Telephone” will probably Win Pop Collaboration. As far as Short Form Music Video, any and all of her three video releases (“Bad Romance”, “Telephone” and “Alejandro”) deserve a nomination. In the Rock and Indie scene The Black Keys, MGMT and Vampire Weekend are buzzed about underground acts that were more successful this year on a mainstream level. All of their releases came out in the first quarter of the year and could be forgotten, but thanks to a little commercialization Black Keys and Vampire Weekend might be up for a few awards, they have songs that have recently gained mainstream success because of television advertisements. However the Indie act of the year that is most likely to get the most nominations are Arcade Fire, whose third album “The Suburbs” was a critical and commercial success. The group has won a Grammy for Alternative Album for both of their previous outings, and now that they are more known on the mainstream level I expect them up for Album of the Year no question. As far as any other possible nominations, I’m not sure but they will probably all fall under the Alternative categories. One last shoe-in for Top 4 nominations is country group Lady Antebellum. I’m not very familiar with them, but I know I have read their name A LOT this past year. They are obviously very popular, and very respected as their second album “Need You Now” has been met with a lot of positive critiques. Again, I’m not familiar with them, but I would imagine Album of the Year isn’t out of the question. And the title track, which rose to #2 on the Pop charts will be a contender for Record and Album of the Year. And the group will most likely dominate the Country categories, as Taylor Swift did last year. And finally the Grammys always have a soft spot for legendary acts making a comeback, and though it wasn’t really a comeback in that sense Sade‘s “Soldier of Love” album single and video will easily compete in a few categories, including the Big 4. That album was released in January and has since lost a lot of steam, but it’s Sade who has won a Grammy for nearly every album released. They won’t be totally forgotten, but I doubt they’ll be nomination leaders. So here are my educated guesses for the Top 4 categories. Question marks on Drake and Jay-Z, Eminem might be too much Hip Hop for that category thus canceling those two (far superior albums) out. Also Sade is a question mark, because after the first single not much attention was paid to that album. I’ve been talking about the majorly successful artists who are sure to get nominated, however let’s shift things to the underrated outings that should be up for something this year. Rihanna’s “Rated R” is a pop album on par with Janet Jackson’s “The Velvet Rope” which is a gift, but could be a curse at the Grammy’s. Janet’s 1997 album was met with the best critical praise in her career, but was ignored on Grammy night (only receiving a nomination for Short Form Video). Even though “Rated R” deserves a shot at Album of the Year, it’s doubtful she will snag it. However Rihanna will do well for herself this year, “Love the Way You Lie” alone will get her a few major nominations but also her big hit “Rude Boy” should be up for Female Pop Vocal and maybe Pop Single or they might even put her in the R&B race. In R&B, Usher will most likely dominate as “Raymond v. Raymond” and it’s re-release “Versus” generated two big Pop singles and three pretty big R&B singles. However looking past the mainstream, hopefully Erykah Badu‘s “New Amerykah Part Two (Return of the Ankh)” and controversial video and single “Window Seat” will be shown some love tonight. As well as Toni Braxton‘s “Pulse”, which was all but forgotten shortly after it was released despite being a very solid R&B album with one of the better R&B songs to come out in years “Hands Tied”. And though I’m not personally vouching for these releases, I could see Monica and Fantasia up for some awards. Though these outings were a bit lackluster for me, they were met with a lot of praise from R&B fans. And even though she’s hard to put in a box of just one Genre, and even though she’s more than likely going to be up for New Artist, Janelle Monae will hopefully be given her due as she put out one of the most original and creative albums of the year with “TheArchAndroid”. Producer Danger Mouse might have too mellow of a sound to take notice to, but his collaboration with James Mercer of The Shins “Broken Bells” should be up for Album of the Year. It’s doubtful it will, but it deserves to, and if it doesn’t I hope to see them competing for multiple categories in the Alternative categories. Also Danger Mouse’s collaboration with Sparklehorse might be a topic of debate, it was leaked digitally last year but was released officially this year with several guest artists from different generations of Rock and Alternative music. Even if that album isn’t nominated for anything, his output alone should get him a nomination for Producer of the Year. Another alternative group that I think are more than deserving of some mentions are Surfer Blood whose “Astro Coast” was one of the most solid albums released this year. They aren’t popular hardly at all on a mainstream level, but hopefully enough hipsters voted and they could possibly break through. Kelis and Robyn linked up for a tour this summer, and they should both be up for Grammy gold in the Dance and Electronic categories. Kelis’ “Flesh Tone” was a sharp departure for her, as it was a total dance album. And not a watered down pop version of Dance, it’s up there with some of the best and respected Dance albums of the past. Hopefully we’ll see her name in a few categories. Robyn released three EP’s this year (only two are eligible), and if that invalidates her from any album categories, her two singles “Dancing on my Own” and “Hang with Me” are miles better than the radio staples I expect to see up for Dance Recording (that really don’t deserve to be there). Another Electronic act that got a lot of praise for his recent release was LCD Soundsystem. “This is Happening” got loads of critical praise, and since he’s been nominated three times in the past, I’m sure he’ll get a nomination this year. As well as Gorillaz, who’s album “Plastic Beach” isn’t necessarily one of my favorites of the year but deserves to compete, and they should also be up for Short Form Video for “Stylo”. And Big Boi, his first solo album “Sir Lucious Left Foot, The Son of Chico Dusty” came and went with little fanfare, but it’s a really solid album with some solid singles that should be up for multiple Hip Hop categories. The Roots could be singled out because of heavy competition in the Hip Hop categories for their album “How I Got Over”, but I expect to see their collaboration album with Grammy favorite John Legend “Wake Up!” possibly in the Traditional R&B Album category since it’s a celebration of classic soul songs, and a truly great album. So there are my predictions, as I said earlier I’m not as confident about these predictions as years prior, but I think I’m on the right track. We’ll find out tonight. And than we’ll discuss the nominations and predict winners shortly after.